In previous posts I have shown data for global manufacturing output by country. One of the things those posts have showed is that manufacturing output in China is growing tremendously, but it is also growing in the United States. The chart below shows manufacturing production by country as a percent of GDP. China dominates again, with over 30% of the GDP from manufacturing. 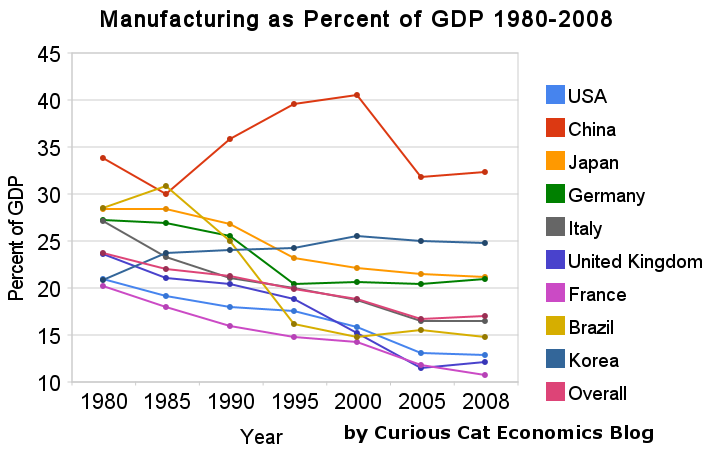 Chart showing manufacturing output, as percent of GDP, by country was created by the Curious Cat Economics Blog based on UN data* (based on current USA dollars). You may use the chart with attribution. For the 14 biggest manufacturing countries in 2008, the overall manufacturing GDP percentage was 23.7% of GDP in 1980 and dropped to 17% in 2008. I left India (15% in 1980, 15% in 2008), Mexico (20%, 18%), Canada (17%, 13%), Spain (25%, 14%) and Russia (21% in 1990 [it was part of USSR in 1980], 15%) off the chart. Over the last few decades Korea, and to some extent China, are the only countries that have increased the percent of GDP from manufacturing. China has not only grown manufacturing activity tremendously but also other areas of the economy (construction, mining, information technology). The countries with the largest manufacturing portions of their economies in 2008 were: China 32%, South Korea 25%, Japan and Germany at 21%. The next highest is Mexico at 18% which declined slightly over the last 15 years (with NAFTA in place). Globally, while manufacturing has grown, other areas of economic activity have been growing faster than manufacturing. The manufacturing share of the USA economy dropped from 21% in 1980 to 18% in 1990, 16% in 2000 and 13% in 2008. Still as previous posts show the USA manufacturing output has grown substantially: over 300% since 1980, and 175% since 1990. The proportion of manufacturing output by the USA (for the top 14 manufacturers) has declined from 31% in 1980, 28% in 1990, 32% in 2000 to 24% in 2008. The proportion of USA manufacturing has declined from 33% in 1980, 29% in 1990, 36% in 2000 to 30% in 2008. While manufacturing output has grown in the USA it has done so more slowly than the economy overall. * I made edits to the 1980 Brazil manufacturing data and 1980, 1985 and 2008 China manufacturing data because the UN data only showed manufacturing data combined with mining and utility data. And I am using older UN data that had manufacturing separated from mining and utility figures for China in the other years. Sales of new single-family houses in May 2010 were at a seasonally adjusted annual rate of 300,000, according to estimates released jointly today by the U.S. Census Bureau and the Department of Housing and Urban Development. This is 33% below the revised April rate of 446,000 and is 18% below the May 2009 estimate of 367,000. The median sales price of new houses sold in May 2010 was $200,900; the average sales price was $263,400. The seasonally adjusted estimate of new houses for sale at the end of May was 213,000. This represents a supply of 8.5 months at the current sales rate. This is not a good sign for the economy. At the same time, we have to absorb the overbuilding bankers financed a few years ago. The damage that caused is still being dealt with. The low number of new home sales provides us some bad news on how bad things were. Until new home sales rebound to over 600,000 a year this will be a large drain on the ability to grown jobs and the economy. You have to go back to 1991 to find a year with fewer than 600,000 (other than the last 2, of course). Many aspects of personal finance can get a bit confusing or require some study to understand. But really much of it isn’t very complicated. Debt is often toxic to personal financial success. The simple step you can take to avoid the problems many face is to just not buy things until you save up for them. If you want some new shoes or new Droid Incredible or to go see a football game (American or World Cup style) that is fine. Just save up the money and then spend it. If you limit your borrowing you will get ahead financially. I think borrowing for a home is fine (I suggest saving up a 20% down-payment – or at least 10%, and many banks are again requiring this sensible step). And don’t overextend yourself – borrow what you can comfortably afford – even if you run into financial difficulty. It might be likely you earn more 5 years from now, but it is certainly possible you will earn less. Remember that. Borrowing for school is fine but be careful. Huge education debts are a large burden. Don’t ignore this factor when selecting a school. And don’t fall prey to the for-profit education scams that have become very prevalent. I would be very very skeptical of any for profit educational institution and would much prefer long term public or private institutions with long term success (colleges, universities and community colleges). Technical training can be very good but you have to be very careful to not be taken advantage of. Borrowing for a car is ok, but I would avoid it if possible. And other than that I would avoid debt, if at all possible. If you want a big expensive wedding, fine, save up the money. If you want a vacation to East Africa, great, save up the money. 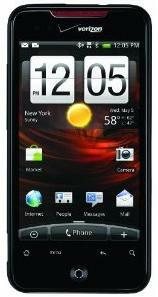 If you want the latest, new tech gadget, great save up the money first. And saving up for your emergency fund (if it isn’t fully funded already) and for retirement should be right after food, shelter, health and disability insurance and any debt you already have to be paying back. After you have committed money to your emergency fund and retirement then choose what to do with your remaining discretionary income. It is critical to have built up an emergency fund so if you have any emergency you can tap that without going into debt and digging yourself a personal financial hole you have to dig out of. Personal financial success is not some get rich quick scheme or magic. Success is Achieved by doing some really simple things well. It is not complicated but that isn’t the same thing as easy. Showing restraint is not what we are urged to do by the marketers. So while not buying what you can’t afford is not exactly an amazing insight, hundreds of millions of people (in the USA and Europe I know, and probably everywhere that consumer debt is easy to get) fail financially just because they refuse to follow this advice. Related: Avoid credit card debt – How to Protect Your Financial Health – Curious Cat personal finance basics – Can I Afford That? For years I have thought Microsoft was in deep trouble and yet they were continuing to generate tons of cash (which is not something to take lightly – it is a very strong signal of a successful business). But the future for them just keeps looking worse and worse, to me. The Windows and Office profit centers seemed doomed to collapse (Ubuntu is a great operating system and you have Open Office and Google doc both of which I find fine). The server business and managing corporate networks is one of the few hopes for Microsoft, I think. And things don’t look good there (though probably better than the other profit centers). It isn’t as though Microsoft doesn’t see the problems. They are trying to build up a gaming business and they have hopes there, I think (not to replace current profits but at least to capture some significant profits). I really am amazed how poorly they have done online. They have invested a ton and continue to lose a huge amount every quarter (over $700 million in the quarter ending March 31st of this year. Yet year after year Microsoft continued to have tremendous earnings. I can’t see it continuing, but I would not have predicted the earning power they have shown the last 5 years so what do I know. In April Microsoft announced record third-quarter revenue of $14.50 billion for the quarter ended March 31, 2010, a 6% increase from the same period of the prior year. Operating income, net income and diluted earnings per share for the quarter were $5.17 billion, $4.01 billion and $0.45 per share, which represented increases of 17%, 35% and 36%, respectively, when compared with the prior year period. There is the prayer that the huge amount they invest in research provides future earnings. I do believe their research is incredibly valuable. But I can’t see betting they will find enough earning to replace the losses I anticipate for Windows and Office revenue. Apple (about $245 billion) has overtaken Microsoft (about $227 billion) in market capitalization. To get the enterprise value (the value of the company excluding cash). Apple has about $38 Billion in cash (including $18 billion in treasuries with a maturity of over 1 year – so not shown as cash on the balance sheet). Microsoft has about $31 billion in cash ($37 billion – $6 billion in debt). Therefore Apple’s business is valued at $207 billion and Microsoft at $196 billion. Since Mr. Ballmer took over from Bill Gates as CEO in January 2000, Microsoft’s market value has more than halved from $556 billion to Wednesday’s close of $219 billion. Rival Apple’s market value has surged from $15.6 billion to $221 billion over the same period. I made 6 more loans to entrepreneurs through Kiva today, including the 2 mentioned below. I have now made 227 loans through Kiva. Christopher Kibubi Wahinya (in photo), Nairobi, Kenya, buys old computers, which he repairs and sells to the local people. He has been in this kind of business for the last four years and he says that the business is profitable. He is using his loan of Kes 50,000 to purchase old computers, repair them and sell to the local people. He plans to grow his business by moving to the ground floor of a busy building where he will stock all computer accessories and later own a computer showroom. Carlos Alberto Pereira Granados is 43 years old and resides in the town of Cojutepeque, El Salvador. He has a workshop where he repairs sewing machines and sells all types of related parts. His business is located at the municipal market. Carlos Alberto works Monday through Sunday repairing the machines of his customers. He is requesting a loan so that he can buy sewing machines wholesale as well as parts such as bobbins, belts, hooks, and other items so that he has everything required to perform his work and attract more customers. Kiva is a great way to support entrepreneurs. I try to focus on loans I think will benefit the borrower and grow the economy (not always easy). One of the things I try to watch is the “portfolio yield” (which is similar to Annual Percentage Rate) – the lower the better. Some banking Kiva partners are charities or partially funded by charities and therefore can 1) fund some of the administrative expenses of the bank and 2) are focused on helping the customers not making a profit. I would rather have my money used where it most helps entrapranuers so the lower the rate the better. I encourage you to join me: let me know if you contribute to Kiva and I will add your Kiva page to our list of Curious Cat Kivans. Also join the Curious Cats Kiva Lending Team (the team has now lent over $7,500). On Wednesday, France, which was the last holdout in Western Europe maintaining an official retirement age of 60, proposed increasing it to 62 by 2018. On the same day, California’s Republican Gov. Arnold Schwarzenegger announced a deal with four state public employee unions to raise the retirement age by five years for newly hired workers. These moves follow several recent age increases across Europe and among U.S. states. Faced with one of the worst pension shortfalls in the country, Illinois in March lifted the retirement age for new state workers from as low as 55 all the way to 67. Greece, until recently, allowed workers in more than 580 job categories considered hazardous to retire with full pensions as early as age 50 for women or 55 for men. In response to its fiscal crisis, that country has raised the retirement age to 65 for most workers. In Ireland, the government has proposed gradually raising the retirement age from 65 to 68. Hungary raised its retirement age in 2008 from 62 to 65 — one big reason why the ruling Socialists got trounced in parliamentary elections in April. We have not raised retirement age along with our increasing longevity. That is workable, if you save enough extra during your work life to enjoy a longer retirement. However, we are not saving even enough to retirement properly even if the life expectancy had not increased over the last 50 years. Governments have failed to take a sensible retirement strategy for dealing with longer life expectancies. They can lower benefits, move back the retirement age or increase the amount they put aside to pay benefits. Most likely it takes a combination of all 3, or at least 2 of the options. As I have said for a long time one smart move governments should make is to make it easier to ease into retirement by going part time. This is good for the economy and good for people and helps deal with the problem of extending the retirement age too far (where many that age have trouble working full time). That sounds like a lot, but it’s better than it was before: At its peak in the first quarter of 2008, the debt-to-income ratio stood at 131%. Economists tend to see 100% as a reasonable level, so we’re almost a third of the way there. Since household debt hit its peak in early 2008, banks have charged off a total of about $210 billion in mortgage and consumer loans, including credit cards. If one assumes that investors suffered at least that much in losses on similar loans that banks packaged and sold as securities (a very conservative assumption), then the total – that is, the amount of debt consumers shed through defaults – comes to much more than $400 billion. Problem is, that’s more than the concurrent decrease in household debts, which amounts to only $372 billion, according to the Federal Reserve. That means consumers, on average, aren’t paying down their debts at all. Rather, the defaulters account for the whole decline, while the rest have actually been building up more debt straight through the worst financial crisis and recession in decades. Interesting data, and not good news. We need to reduce consumer debt levels by reducing the borrowing we are doing. This is not a new need. We have been living beyond our means for far too long. That is not a solid base for an economy. It does boost current GDP but only by consuming future productive capacity (when you borrow from external sources – other countries – as we have been doing). Costs are rising relentlessly for both families and for the state government. The median annual premium for family plans jumped 10% from 2007 to 2009 to $14,300 — again, that’s a substantial rise on top of an already enormous number. For small businesses, the increase was 12%. In 2006, the state spent around $1 billion on Medicaid, subsidies for medium-to-lower earners, and other health-care programs. Today, the figure is $1.75 billion. The federal government absorbed half of the increase. Interesting article. I don’t agree with all their claims. It isn’t as though expecting to go from the extremely broken system we have suffered with for decades to one without flaw is a likely outcome. What would be nice is if we can learn from experiments and adjust. Those who profit enormously at the expense of society from the current system are going to provide critiques of any changes. And those that want to fix the broken system should listen to sensible criticism and make improvements (not just defend any changes because the existing system is so bad). I have a theory that you should invest in the companies that you hate the most. The usual reason for hating a company is that the company is so powerful it can make you balance your wallet on your nose while you beg for their product. Oil companies such as BP don’t actually make you beg for oil, but I think we all realize that they could. It’s implied in the price of gas. Perhaps you think it’s absurd to invest in companies just because you hate them. But let’s compare my method to all of the other ways you could decide where to invest. Technical analysis involves studying graphs of stock movement over time as a way to predict future moves. It’s a widely used method on Wall Street, and it has exactly the same scientific validity as pretending you are a witch and forecasting market moves from chicken droppings. When companies make money, we assume they are well-managed. That perception is reinforced by the CEOs of those companies who are happy to tell you all the clever things they did to make it happen. The problem with relying on this source of information is that CEOs are highly skilled in a special form of lying called leadership. But What About Warren Buffett? The argument goes that if Warren Buffett can buy quality companies at reasonable prices, hold them for the long term and become a billionaire, then so can you. Do you know who would be the first person to tell you that you aren’t smart enough or well-informed enough to pull that off? His name is Warren Buffett. Again, I remind you to ignore me. As usual he is funny, he also makes many good points. We have mentioned his financial advice previously: Financial Planning Made Easy, Scott Adams on Investing. Consumer debt grew by about $100 billion each year from 2004 through 2007. In 2009 it has fallen over $112 billion so far: from $2,561 billion to $2,449 billion. Through April of 2010 total outstanding consumer debt $9 billion (so essentially it has been at a standstill). This still leaves over $8,000 in consumer debt for every person in the USA and $20,000 per family. The huge amount of outstanding consumer and government debt remains a burden for the economy. At least some progress is being made to decrease consumer debt. Those living in USA have consumed far more than they have produced for decades. That is not sustainable. You don’t fix this problem by encouraging more spending and borrowing: either by the government or by consumers. The long term problem for the USA economy is that people have consuming more than they have been producing. The solution to this problem is to stop spending beyond your means by even increasing levels of personal and government debt. Thankfully over the last year at least consumer debt has been declining. Government debt has been exploding so unfortunately that problem has continued to get worse. Data from the federal reserve.